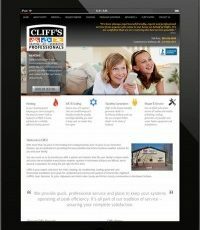 "Cliff’s AC came out to diagnose a home AC that was sometimes working and sometimes not. They were prompt, called to alert to their arrival, tested the system and offered options. " Welcome to the new cliffsheating.com! In an effort to accommodate our customers, we have implemented a new website that gives you the opportunity to view what you need when you need it with a responsive website that is optimally viewable on all types of devices, including tablets and smart phones. "They really know how to do their jobs. It's been over 30 years since I started using their services and I would never consider hiring anyone else."